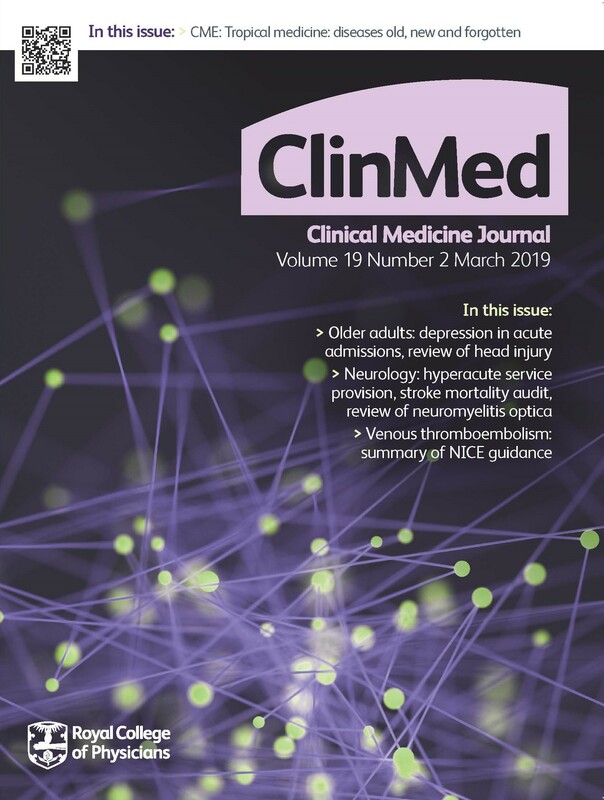 The Clinical Medicine journal seeks to encourage high standards of medical care by promoting good clinical practice and influencing policy through original research and articles on topics including current issues, law and ethics. Aimed at practising physicians in the UK and overseas, the journal assists the RCP in supporting a wide range of specialties through a dedicated continuing medical education (CME) section which presents the latest advances in a chosen specialty, with self-assessment questions at the end of each topic enabling CPD accreditation to be acquired. Global warming and arboviral infections – considering the impact of climate change on three arboviruses, with particular consideration of the effect on Europe. Recognition and treatment of depression in older adults admitted to acute hospitals in England – examining the proportion of older adults diagnosed with depression in acute hospitals, treatment, referral, and communication between secondary and primary healthcare services following discharge. Stroke mortality audit using the Structured Judgement Review method – exploring Royal Cornwall Hospitals Trust's mortality review of patients admitted with stroke. Set up by the World Health Organization (WHO), the Hinari Access to Research for Health Programme and the Programme for the Enhancement of Research Information (PERI) provide free or low-cost online access to journals across Africa, Latin America, Eastern Europe, Central Asia and the Middle East. Working with these organisations, Clinical Medicine is committed to supplying non-profit institutions in developing countries with access to vital material, at greatly reduced or no cost. Clinical Medicine openly invites submissions for consideration and peer review. The editor is assisted by members of the editorial board along with expert referees in the evaluation of submissions and accepted papers are scheduled for publication at the discretion of the editorial office. Please refer to our instructions for authors document for examples of the type of material we publish and guidance on formatting your paper before you submit work. If you have any queries please email the editorial office: clinicalmedicine@rcplondon.ac.uk.